A beautiful Wellington day greets passengers from the Southern Cross at the start of this 1950s magazine film. Seen here on her maiden voyage around the world, the cruise ship Southern Cross was built to carry immigrants from Europe. 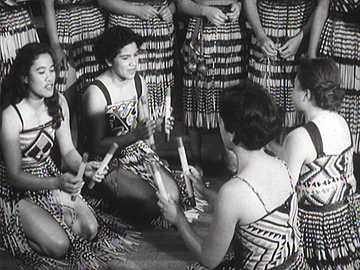 Meanwhile, students at what was then New Zealand's only fully residential teachers' college (near Auckland) are seen studying, before taking time off for dancing and sport. A trip to New Caledonia rounds up the report with the unveiling the Cross of Sacrifice, a memorial to the 449 Kiwis who died without a grave in the South Pacific during WWII.